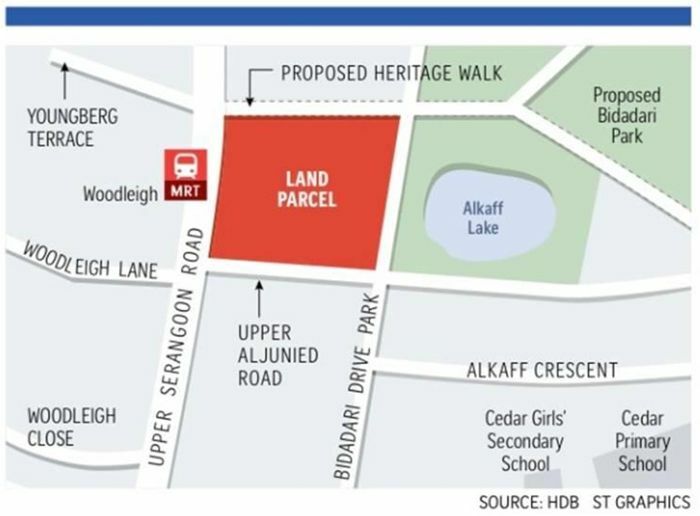 On Monday (06 March 2017), the Housing and Development Board (HDB) of Singapore have put up a mixed-use site at Upper Serangoon Road for sale via public tender – under the Government Land Sales (GLS) programme. This site has been deferred for tender since last December – just 2 days before the end of 2016, to allow more time to finalise requirements of the site for the purpose of having a “comprehensive development”. This includes sorting out details for the requirements of building and integrating a community club and a police centre within the neighbourhood. On top of these, there are also considerations and criteria to construct a commercial underpass and bridge for better connectivity within the estate. As part of the plans to develop the Bidadari precinct – zoned as the new Eco town of Singapore, the winning tenderer of this 99-year leasehold plot will also be strongly encourages to work with operators and tenants of retail, F&B and entertainment outlets for the adoption of productive formats introduced by Spring Singapore, which is planning to help raising productivity of retail outlets and food services. Given the site’s strategic location and being next to Woodleigh MRT Station, property consultants have stated it to be a choice site which will set to draw strong buyers’ interest with Bidadari’s given attraction as a mega residential project. Due to its proximity to the MRT station and being in a highly sought-after location, analysts are expecting the future new launch project to be a strong draw for home buyers. However, the only restraint – especially for property developers who are interested would be the potentially high land price. Based on estimation, the top bid could come in at no less than S$710 per sq ft per plot ration (psf ppr) to a high of S$900 psf ppr – resulting in a staggering quantum between S$680.5 to S$863 million. Market watchers have also added that they are expecting a total of 8 to 16 bids being submitted. Spanning across a land area of approximately 273,844 square feet (sq ft), the mixed-use site has a total gross floor area of around (958,450 sq ft) and can yield an estimate of 825 homes. The tender will close at 12noon on 13 June 2017.